I started with a kraft base and added a notched-corner striped layer and a dotted layer. I added different colored brads to each corner. I tied an olive ribbon around the car and added two turquoise pieces of ribbon through the knot. The cupcake was stamped in palette noir on a white circle cut with nesties, the holder was pieced, and the frosting was colored using my aquapainter and saffron and marigold inks. It was layered on a kraft mat, also cut with nesties. 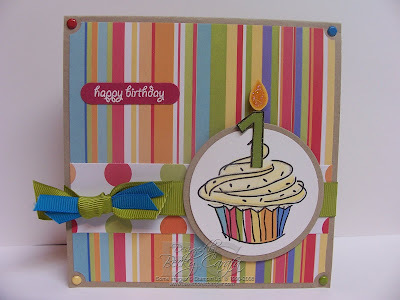 I attached it to the card front with dimensionals, and added the 1 "candle" and flame. The 1 is from the SU numbers wheel, and the flame is actually a leaf from PTI's Beautiful Blooms. I outlined the 1 with my glitter pen, and put stickles on the flame for a little sparkle. I white embossed the sentiment on pomegranate cs, punched it out with the word window punch, and attached it to the card. I hope you will find time to play along with us today, make sure to leave a comment and a link so we can check it out! Also, see the samples the rest of the team made. Thanks for stopping by! Fabulous card, Becky! Great colors and I love the number 1 for the candle. This is so cute! Love how you made the candle out of a '1'... genius! So cute Becky! I just can't seem to get enough of cupcakes lately! very pretty! I love the bright colors! I LOVE your card. The colors are BEAUTIFUL!!! This is such a great card!! I love the all the fun birthday colors! And that candle is too cute! Oh, this is cute! I love the colors. Great card. TFS! Very cute! Love the coloring! Such a super cute card!! I love the colors and the paper!! I love the card!! Great colors and I love the details!! this is totally cute! great fun colors! Cute, cute, cute! I love the number one candle--great idea. This is so darling! I love the dp and the motive! WOW! This is adorable. The one as the candle is super clever Becky. You rock.